Made for the Movie Game Jam 2018, Temple Escape is an action platformer based upon Indiana Jones and the Raiders of the Lost Ark. 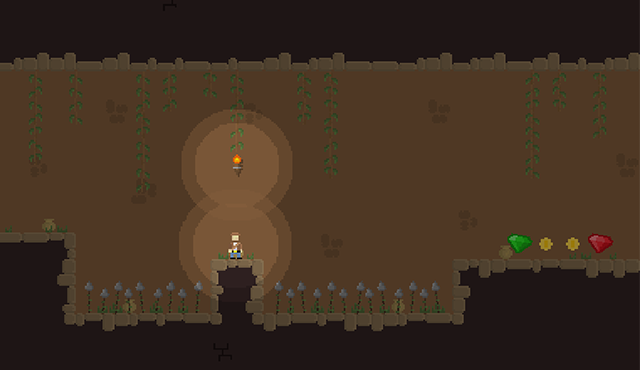 You're an adventurer that resembles Indy, but lacking the whip, and you have to collect treasures in the form of coins and gems, dodge enemies and find your way to the end of each level. The overal quality reminds me a lot of some old DOS games like Dangerous Dave, where you basically have to do the same thing, collect treasures and reach the end of the level. The trickiest part of the game might be the platforming. The developer did his best to find balance in the difficulty; it's easy to pass each level, but if you're a 100% collector, some treasures might be a little bit hard to reach and will surely take you several tries before you get it. Once you've passed through several rooms you end up near a pedestal with an idol, and once you've picked that up the intense part of the game begins. A giant boulder moves in from the left and it's your job to stay ahead while dodging spikes, endless pits and make insane jumps. Overal this game is a pretty fun time-waster. It's a complete game made in 10 days, and it looks very polished. The controls are easy, you use [W] [A] and [D] to move and jump, and the animations are smooth, and the soundtrack brings the atmosphere. All in all, it's a solid game that will keep you occupied for a short while and will make you hungry for more.